An 8x10 black and white photo signed by Stan Laurel. Laurel has signed the bottom in blue marker with the added inscription “Hello Marie! Pres. Taft 1937” and in our opinion the signature rates an 8. 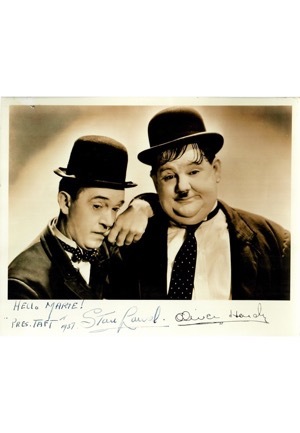 The Oliver Hardy signature has been stamped beside Laurel's. Accompanied by a LOA from JSA.